Home > CVS > Huggies Coupon | $3.24 Per Pack! Huggies Coupon | $3.24 Per Pack! If you need diapers, CVS is your store this week! 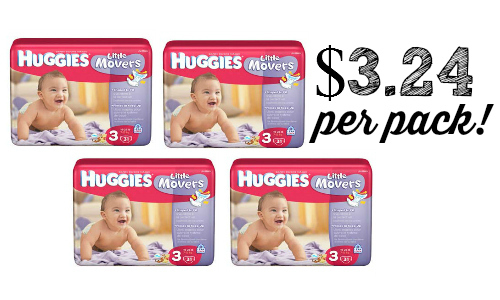 You can print a Huggies coupon to get diapers for as low as $3.24 per pack. To get the best deal you’ll need a CVS coupon from the coupon machine. If you don’t have it you can still get a good deal though. The deal runs 12/20-12/26. You can see the full weekly ad here. Note: you’ll need (2) computers to get (4) copies of the Huggies coupon.